Leading off today: Jack Lambert went 6-for-6 from the free-throw line in the final 50 seconds of the third overtime, sealing Cooperstown's 108-98 victory over Greenport in the NYSPHSAA boys Class C basketball semifinals Saturday in Binghamton. Lambert set a tournament final four record with 53 points Floyd L. Maines Arena. The senior went 20-for-32 from the field, including a 4-for-7 on 3-pointers. He also had seven steals and five assists. "Obviously the game went to a few overtimes, but the guys trust me," said Lambert, who scored 18 first-quarter points to approach his game average of 22.9. "I was knocking down some shots early and just kept it going. I had no idea how many points I had, when they announced it, I was just like, 'Wow, that's crazy.'" Sophomore John Kennedy finished with 25 points and a game-high 22 rebounds. His seven points down the stretch of the second quarter helped Cooperstown to a 43-42 lead at the half. Aside from Lambert's performance, the game set a final four record for combined points with 206. The win puts Cooperstown back in the final for the first time since 2003 with the opportunity to win the program's first championship. The Hawkeyes play Middle Early College, which ended defending champion Lake George's 54-game win streak in the first semifinal with an 80-63 triumph. Jamond Jones scored eight of his 23 points during the Kats' 14-0 run that enabled the Section 6 champs to pull away after the teams were tied at 57-57 midway through the fourth quarter. "We played so well for three quarters," Lake George coach Blake White said. "I thought we could have had a lead if it was not for some of those turnovers. But (Middle Early College) stepped up the defensive pressure in that fourth quarter and it threw us off." Boys Class D: Oppenheim-Ephratah-St. Johnsville used a four-point play by center Tyler Leon with :02 left in regulation to tie and senior reserve Chris Martin scored five points in overtime to left the Wolfpack to a 61-57 victory against Panama. Leon, who led OESJ with 20 points and 21 rebounds, was fouled on his first successful 3-pointer of the season and was fouled. Panama called a timeout, then Leon went to the line and made his free throw. Martin's 3-pointer early in OT but OESJ ahead for good. In another nailbiter, Harrisville survived a barrage of fourth quarter 3-pointers and defeated Marathon 68-65 in the other semifinal. Marathon connected for six 3-point shots in the final period to whittle a double-digits deficit to three points, but the 29 points from Peyton Schmitt was too much to overcome even as Harrisville limped home with 7-for-14 shooting from the free-throw line down the stretch. Girls Class AA: After being knocked out in last year's semifinals by Ossining, West Genesee earned a rematch by going wire-to-wire to beat Bishop Kearney 59-45. Kearney imploded early as 6-foot sophomore Saniaa Wilson was saddled with two quick fouls and picked up a third before halftime. Even then, West Genesee couldn't make the most out of nine points from Catie Cunningham (14 points) for a 16-6 lead and the advantage was only 25-20 entering the third quarter. The Wildcats put it out of reach once Wilson picked up her fourth foul early in the third as Abby Bednarski and Aleysha Castanon combined for four 3-pointers in a 15-2 run. Madison Smith scored 18 for the winners to set up the final against Ossining, a 68-55 winner over Longwood. With UConn women's basketball head coach Geno Auriemma, Huskies commit Aubrey Griffin was her usual dominating self with 37 points to pace Ossining. It was her fourth straight game with 35 or more points, and Griffin tacked on 14 rebounds and three assists. "It just comes naturally," said Griffin, who received her Miss New York Basketball award after the game. "I just come to play." Girls Class A: Pittsford Mendon limited defending Federation champion Jamesville-DeWitt to eight first-half points and went on to a 44-32 victory. "We just kind of locked down on defense and did what we had to do," Vikings senior Alana Fursman said. "We held them to eight points, that was super exciting." J-D cut the 25-8 halftime deficit to a five-point margin late in the third, but a Fursman (13 points) 3-pointer broke the momentum and Mendon carried a 33-22 advantage into the final eight minutes. 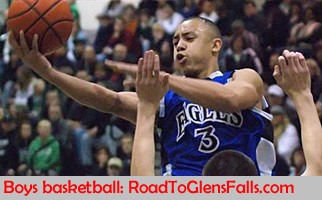 Mendon's opponent in the final will be Binghamton Seton Catholic, a 59-57 winner over Sewanhaka. Senior Marina Maerkl had team highs of 15 points and 12 rebounds, but it was her defensive play in the closing seconds that sealed the win. With two teammates on the bench with five fouls, Maerkl blocked a driving layup attempt by Carly Bolivar, and Sewanhaka could not get a second shot up before the final buzzer.